That isn't a Sun workstation under you monitor is it? 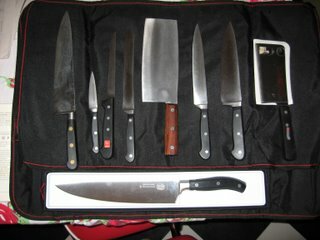 Oh, and yes, I like my crappy 8" Chicago Cutlery pressed steel knife. It's light and always sharpens up quickly and without complaint. That's still my favorite too! It makes a fine monitor stand, don't you think? I'll ask if I can take a picture of some of my other pets. 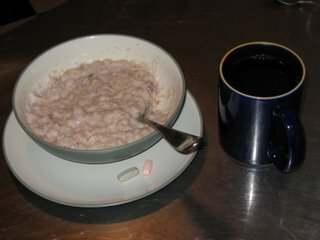 Today's porridge is rolled oats, with walnuts, chopped dates, and Pavel's Yoghurt. Lots of beverage containers parked on that there geek-table. How many hot drinks do you nurse at a time? #Geek Comments, sheesh! This has to be the first C we've seen on eGullet. echo "The Gadget On Top of My Monitor is a $GadgetOnTopOfMonitor so no one can sneak up on me." 03  VString1 PIC X(20) VALUE "Ha-ha, yeah, I used ". 03  VString2 PIC X(20) VALUE "to have a mirror on ". 03  VString3 PIC X(21) VALUE "my monitor, but then ". 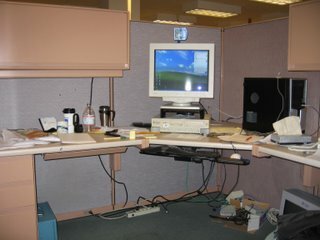 03  VString4 PIC X(24) VALUE "I re-arranged my desk so ". 03  VString5 PIC X(22) VALUE "that my back's against ". 03  VString6 PIC X(09) VALUE "the wall.". DISPLAY "Enter T for Terse, V for Verbose, X to Exit." WHEN Terse DISPLAY "Pff! 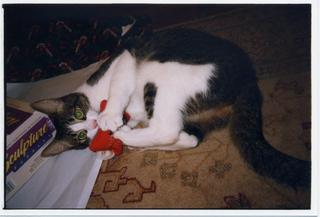 Pack-rat? I can see your desk!" WHEN OTHER DISPLAY "Great thread!!!" Wow the Flaming Gully looked good. It was really interesting. 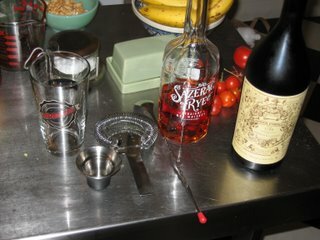 The nutmeg garnish give it a unique flavor and smell. Kind of reminded me of some Belgian Beers. 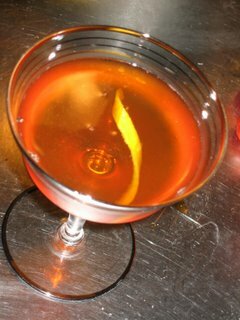 Erik, I haven't been around much, so my question may be outdated, but when Mr. DeGroff invented the Flaming Orange Gully, Velvet Falernum couldn't be had for love or money. Has that changed? Did you buy it locally, or have it shipped? 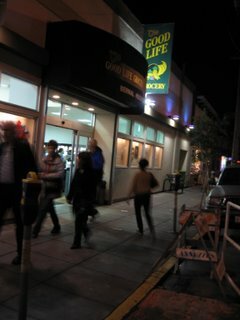 A number of liquor stores here in SF seem to carry it pretty regularly. I forget which one I got it at. Wow, even BevMo carries it now! 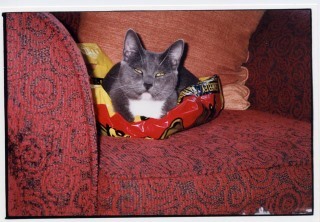 Though, when I run out, I may try making it myself with one of Paul Clarke's recipes. So, I feel a bit bad about deceiving you. 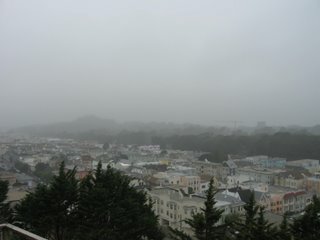 Really, the ocean, Marin Headlands, and Golden Gate Bridge are out there. You just can't see them right now. 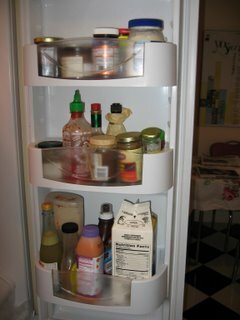 Today for lunch I decided my mission would be to travel out to my favorite nearby Asian Market and get some Red Vinegar. At 19th and Irving you will see something like this. Kentucky Fried Chicken, a bar, and lots of Asian markets and restaurants. 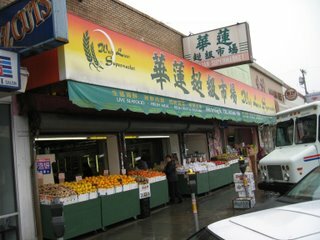 This market is the closest decent sized asian market. 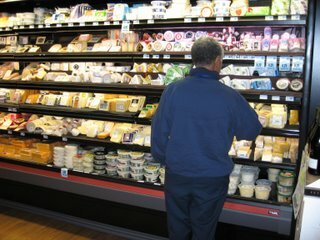 Today, they seemed particularly suspicious of me in the dry goods section of the store, to such an extent that I was a bit scared to take out my camera. I got my Red Vinegar (Great Wall brand, thanks Ah leung) and some Maggi seasoning without incident. 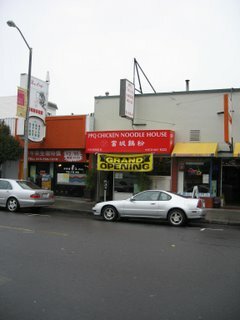 After that I decided to try the new-ish PPQ Chicken Noodle across the street. 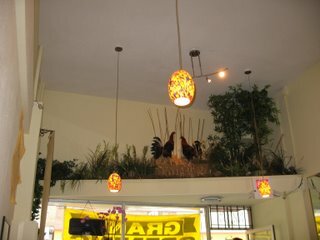 They were quite nice and I was especially impressed with the chicken diorama above their door. I took a picture of that, which endeared me to them, and then I took a picture of my soup noodles. The waitress said, "Oh, I take pictures of my food, especially when I am back in my home country, so I can remember." 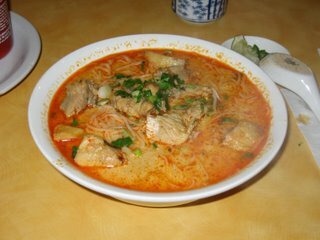 Anyway, really tasty Chicken Curry Noodles. I'll definitely be back. After that I returned to the wet goods side of the store across the street. I'll admit much of what they have there is completely unfamiliar to me. 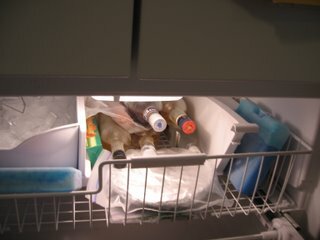 Re-hydrated sea cucumber and other things I can't even guess at. I've been there before looking for specific things; but, I hadn't noticed the butcher section so much. 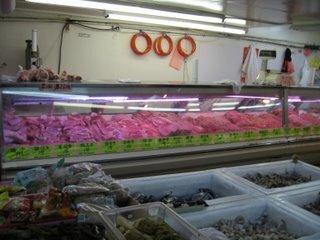 Today I was especially impressed by the pork display. I guess you can't see this particularly well. It starts at one end with trotters and proceeds for the length of the case, not all of which would fit in the picture, with different cuts. 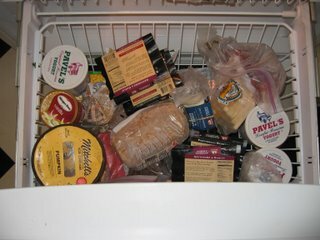 The whole deli case is parts of pork! It's like a shrine to the pig! I have never seen so many different parts of pigs on display. 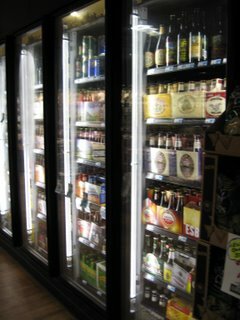 After work, I stopped at our local grocery store to pick up some things. 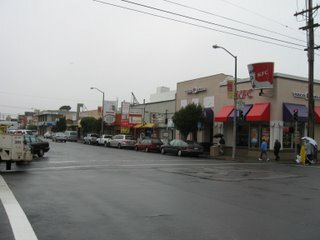 We get most of our day to day supplies from the Good Life Grocery here in Bernal Heights. 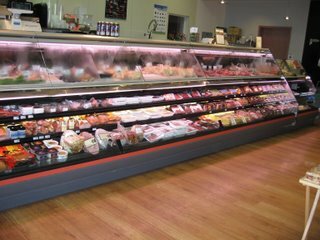 This is the meat deli case. The high turnover items are good. 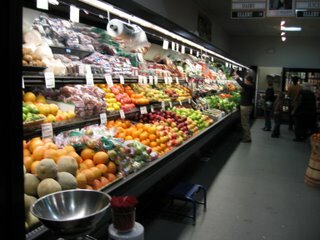 Really, between the Farmers' Market and Good Life, we get 99% of our groceries. Boring technical difficulties resulted in a late return to home. 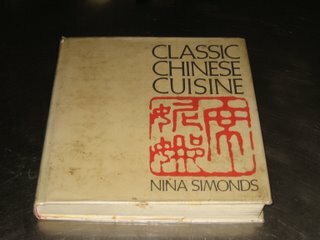 This is my much "loved" copy of "Classic Chinese Cuisine" by Nina Simonds. I decided I would make "Stir Fried Chicken with Cashews". 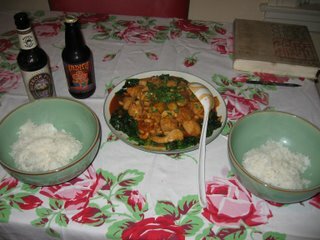 "Classic Chinese Cuisine" is one of the first cookbooks that opened my eyes and taste to new things. 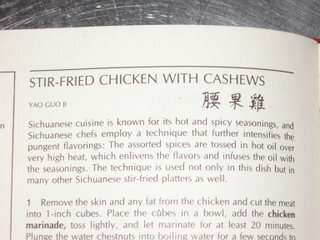 "Stir Fried Chicken with Cashews" is one the first recipes I remember making from it. Just between you and me, I checked out "Classic Chinese Cuisine" from the public library. It was due for return on April 22, 1989. I'm sorry if you have been trying to check it out. 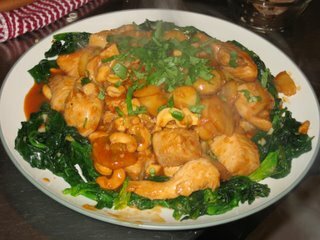 The "Stir Fried Chicken with Cashews" was just so good, I knew I needed to make far more things from it. It's not something I'm proud of. 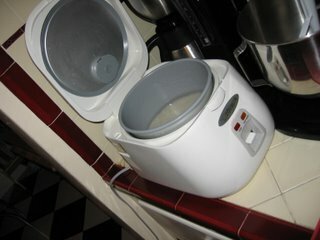 Rice goes in the cooker. 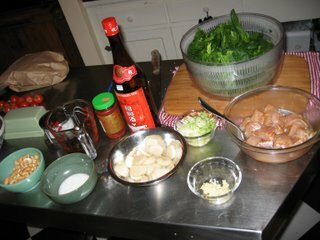 Things are chopped and marinated. It really is tasty and delicious. Today's porridge is toasted scottish style oats with mixed dried fruit, honey, and yoghurt. 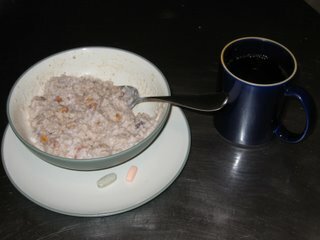 I went with my usual 1/3 cup oats to 1 cup water, and they ended up a bit thick. 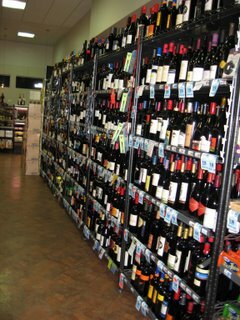 Finished up digesting the SF Chronicle Wine Section and am catching up on work email while I wait for an Electrician, (or someone like him,) to show up and give us a quote for installing a dedicated outlet for our new stove. She's the sleepy, cuddly sister. She's the spazzy, crazy sister. 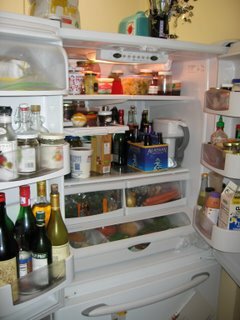 We have the same refrigerator. 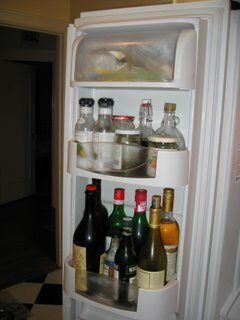 Not the same contents, although I also have homemade limoncello in the freezer. 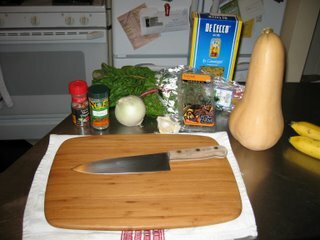 How do you usually prepare your porridge? 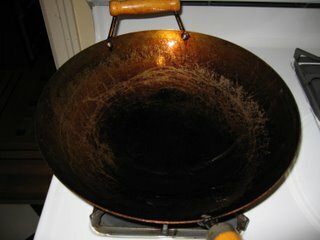 One the stovetop, or in your rice cooker?